In August 2016, we were asked to restore a 2003 SeaVee by applying our marine ceramic coating. The SeaVee had lost its yellow color with constant exposure to the harsh Florida sun. 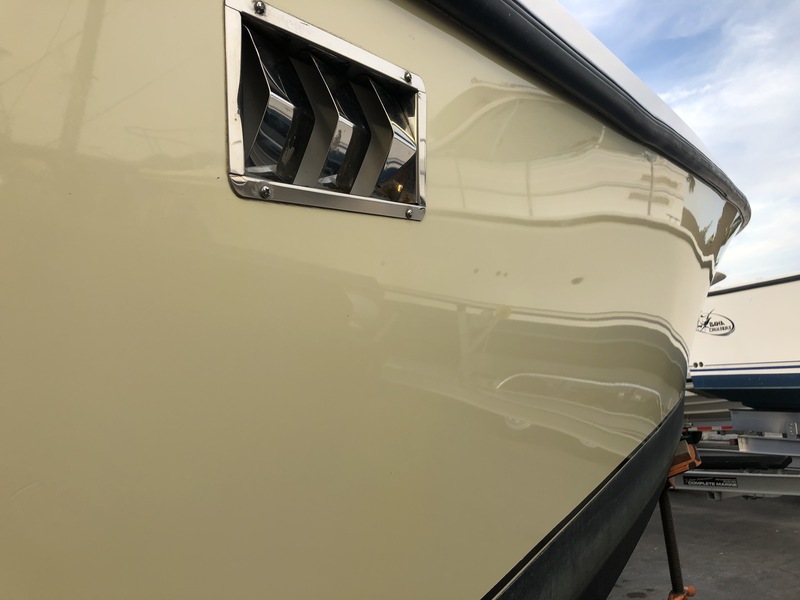 In January 2019 (30 months after the initial application), the boat owner reached out again for a reapplication of our marine ceramic coating. 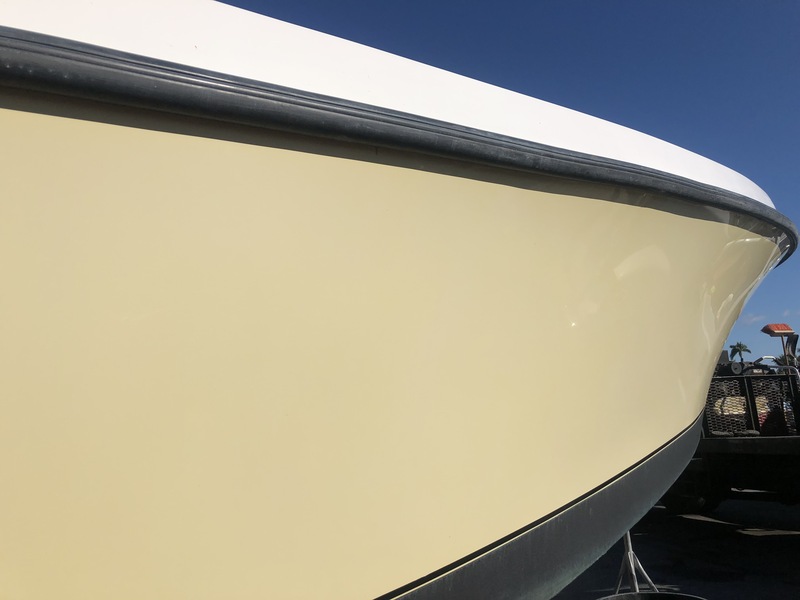 This case study will help demonstrate to other boat owners, detailers, marina's and boat yards on the performance of the Glidecoat marine ceramic coating and the necessary steps for reapplication. Many boat owners are skeptical about ceramic coatings with the biggest concerns centered around the longevity of the coating and if they are worth the cost compared to a traditional buff and wax. 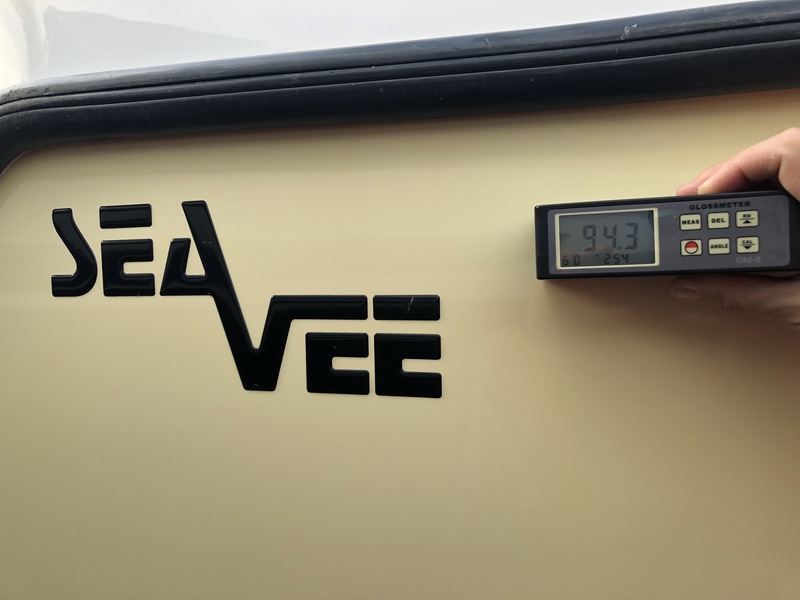 Dean's 2003 SeaVee is the perfect example of how amazing ceramic coatings really are, and how they protect your boat from the elements far better than any wax. Before the initial application in August 2016, Dean's boat was in terrible condition. 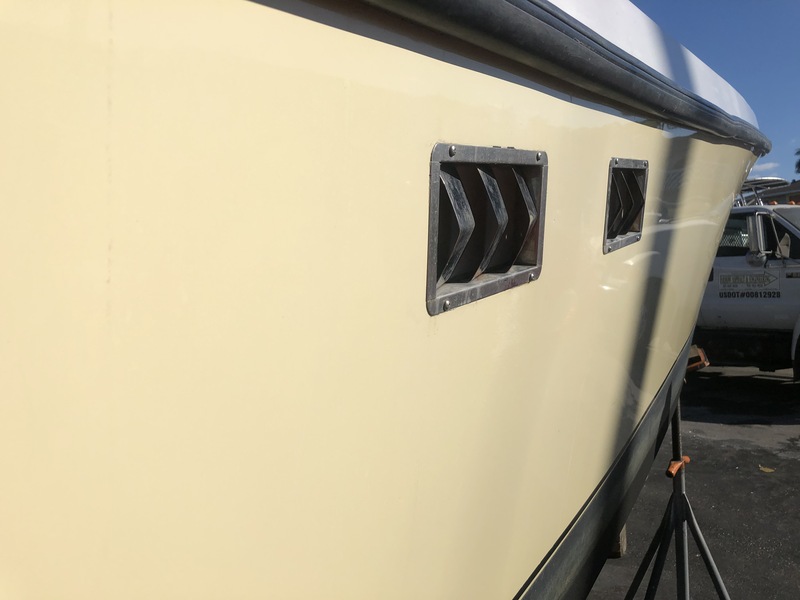 The once yellow hull had completely lost its luster from the harsh Florida sun, with gloss meter readings registering in the mid-teens and as low as single digits. Once completed with our first application of Glidecoat in 2016, we took this once faded and lackluster boat to a better than new finish! The gloss meter readings got as high as 92.4! One year later we checked in on Dean's boat, and the results were impressive. The water was beading on the hull like the day we first coated it, and the gloss meter readings had reduced less than 10%! One year of protection is nice, but the true test came in January 2019, 30 months after the Glidecoat application. 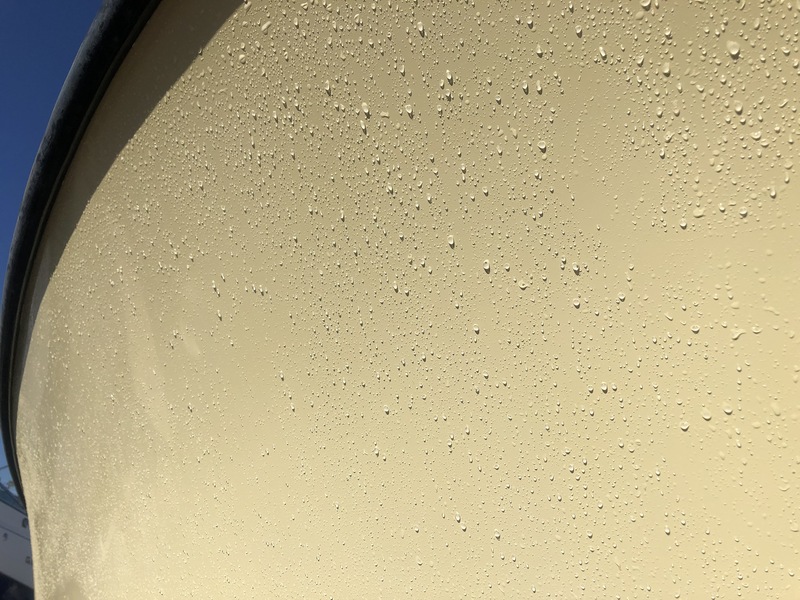 If you still aren't sold on the validity of ceramic coatings, the results of Glidecoat's marine ceramic coating after 30 months will convince you! Dean was truly amazed at the gloss and shine still on the hull, even on the port side which gets constant sun exposure. After 30 months, the gloss meter readings ranged from as low as 50.4 on the port side to as high as 85.1 on the starboard side. Not only did the hull maintain its shine, the water was still beading. This shows that the coating was still effective, not allowing salt to penetrate the pores, even after all that time. The other amazing point was that there were no signs of oxidization on the boat. Because ceramic coatings fill in the pores of the surface and add a protective barrier, they are able to prevent oxidization from occurring, and Dean's boat is the perfect example of that. Now that we've measured the success of the coating over the 30 months, it was time to begin the reapplication of the marine ceramic coating. 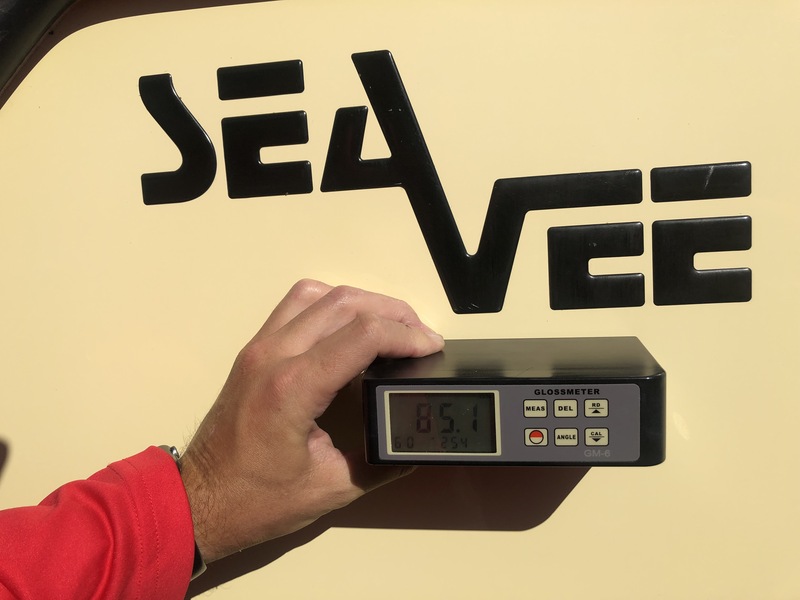 For the initial application on Dean's SeaVee, we spent a total of 4 days completing the work. Due to the heavy oxidization on both the hull and topside, 4 buffing steps were required across the entire boat in order to restore the shine. Once the surface had been restored, we applied 2 coats of our marine ceramic coating. Glidecoat's marine ceramic coating was able to preserve the surface so well over the course of 30 months, that the reapplication process was 40%-60% faster than the initial application. The hard work of removing all of the oxidation was done the first time we applied our marine ceramic coating, so the main goal when reapplying is to increase the shine and remove any minor surface imperfections that may have occurred during that time. The port side hull, which is the highly exposed side, required two steps of buffing. While the starboard side only required one step of buffing before re-coating. The topside also required two steps of buffing before re-coating. This is two to three steps less than the initial application. Once the shine was boosted we reapplied two coats of our nano ceramic coating, which went on easier and smoother than the initial application, and the final results were even better than the first application! Water is still beading on the hull, even after 30 months! The results of the coating over 30 months were truly amazing! The coating protected the surface from the elements 10x longer than wax, while retaining gloss, maintaining a hydrophobic surface, and preventing oxidization. Reapplying the ceramic coating boosted the shine to better than new levels, and even better than results from the initial application. Proving that ceramic coatings will help prolong the life of your gel coat, giving a gloss and shine that is unmatched while also making maintenance a breeze compared to anything else on the market! The gloss and shine is better than ever! Gloss meter readings got as high as 94.3 after reapplying the ceramic coating, which is even higher than the original application of our ceramic coating. Reapplying our ceramic coating will further enhance the surface while prolonging the life of the gel coat. Interested to see the transformation of your boat? Connect with us to discuss the process.